from my travels around blogland. 1) How would you describe your blog to someone who hasn't visited your space in blogland? My blog is a crafty blog that pretty much focuses on my sewing. I got a sewing machine last Christmas and I fell in love. I love trying new tutorials and most of my posts are projects I completed from other bloggers amazing tutorials. I am just starting to make my own patterns... so hopefully one day I can share a few tutorials of my own! 2) In what way does your button reflect your blog? I love the whimsical colors and the fact that it looks handmade, I can see my self using those little trees as an applique pattern. 3) Did you craft your own button? If so, what program did you use? If someone else crafted it, who? Yes, I made my own using Picnik. Homemade by Jill featured a wonderful tutorial on using Picnik and now I am HOOKED! 4) What kind of buttons stick out to you? 5) What's one blog you turn to for inspiration when you are in a creative funk? Wow... there are so many... I will have to go with Homemade by Jill. I love her style. 1) How would you describe your blog to someone who has never visited? A blog that features all kinds of crafts from other blogs. 2) How does your button reflect this blog? 3) Did you make your own button or did you inspire/commission someone to make it for you? I did make my own button that is what makes it So Very Creative, I'm not much of a computer techy so I had to be very creative to make it. I used Picnik to make it. 4) What inspires you to keep blogging? Other bloggers and their creativity! I love finding fun unIque projects, and I love being able to feature them and make someones day! 5) If you could only read one blog today, which one would it be? Um wow this is a trick question right? Well if I could only read one today it would probably be Someday Crafts. 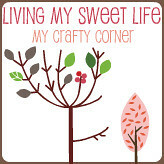 It is the first blog I stumbled upon in the crafty blog world and was the first blog that featured my project from my other blog memakingdo.blogspot.com and made my day and inspired me to start So Very Creative! 1) What five words would you use to describe your blog? Creative, varied, helpful? (I'm hoping, anyway! ), colorful, and crazy. I created it myself :) First I took a picture of my feet, edited it and added text with picnik.com, then turned it into a button with a tutorial from A Heart For Home. It was surprisingly easier than I expected! I wanted to be somewhat literal with the whole 'stepping' thing, so I wanted it to incorporate my feet. I suppose I should have been stepping, but I didn't like the way those shots came out. Anyway, I tangled my feet up in a measuring tape because it was fun. That's what I really want my button to say, that my blog is fun. And I do sew, so the measuring tape does come into play. Go check out the blogs behind the buttons. While you are visiting, make sure you say "HI!" to Sarah, Heather and Liz. Great pics! I must confess I have a bit of a blog button obsession myself so I so enjoy these posts. Oops, maybe I should save that confession for is it Tuesdays confessions, LOL! Keep searching and finding these great buttons and blogs behind the buttons! Yikes . . . not sure what happened in the publishing process. The buttons worked in preview, and didn't work after publishing. No worries . . . the links have been fixed! Thank you for the feature! I love when I unexpectedly see something of mine on another blog! Yay for awesome buttons!! I am off to check out the other 2 sites!